The constant construction in Toronto's Corktown neighbourhood is a nightmare right now. 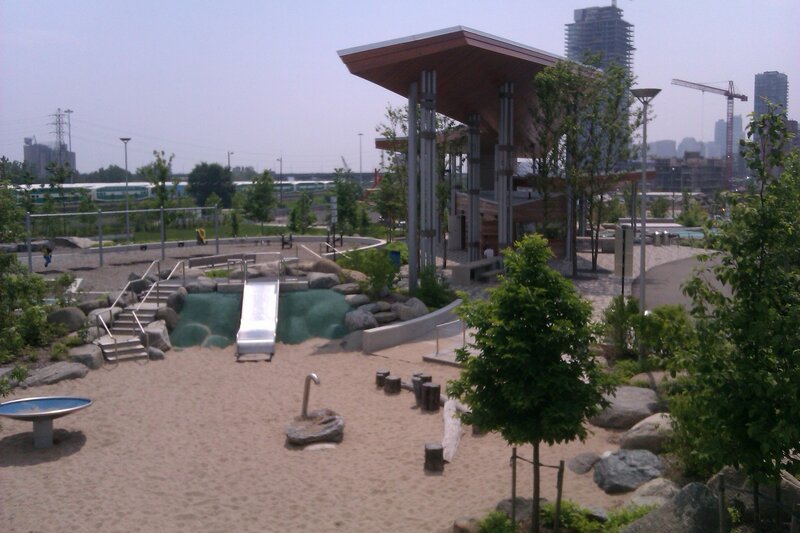 Since streets are blocked and the Don Valley Bike Trail has an unmarked detour around there, it took me an hour to find Toronto's newest park: Corktown Common. When I did find it, I was struck by the beauty of the park, and the sea of construction surrounding it from all sides. However, there are some seriously outstanding things about this paradise. First off, the park is freaking gorgeous! The large grassy areas are perfect for reading on a sunny afternoon. The splash pad is a fun place to cool down when it gets blisteringly hot, just watch out, it's full of squealing kids having the time of their lives. The playground makes me wish I was a kid again, it's colourful, well designed, and has equipment that I totally had to try out for myself. It's like the designer had a crazy dream of melding the worlds of The Flintstones and The Jetsons on a playground. 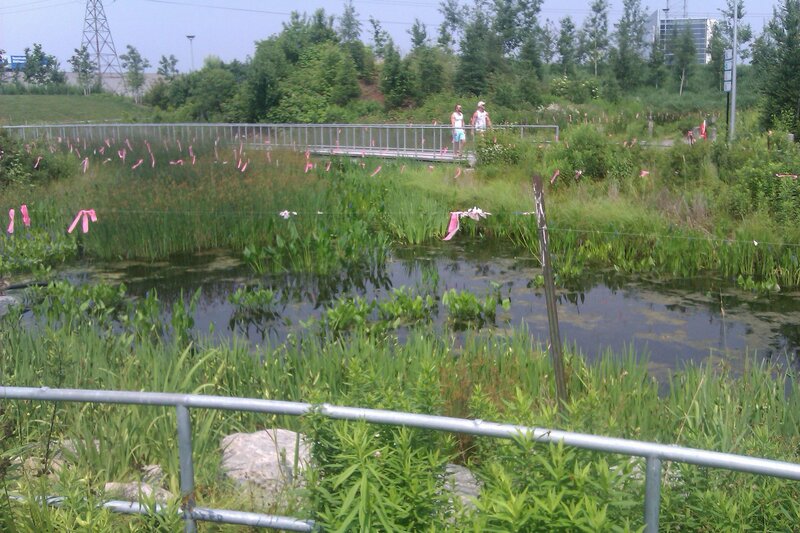 I could have spent my entire day just staring at the beautiful marsh with the little pink ribbons hanging over the water (through my research I found out those were used for keeping large birds away). 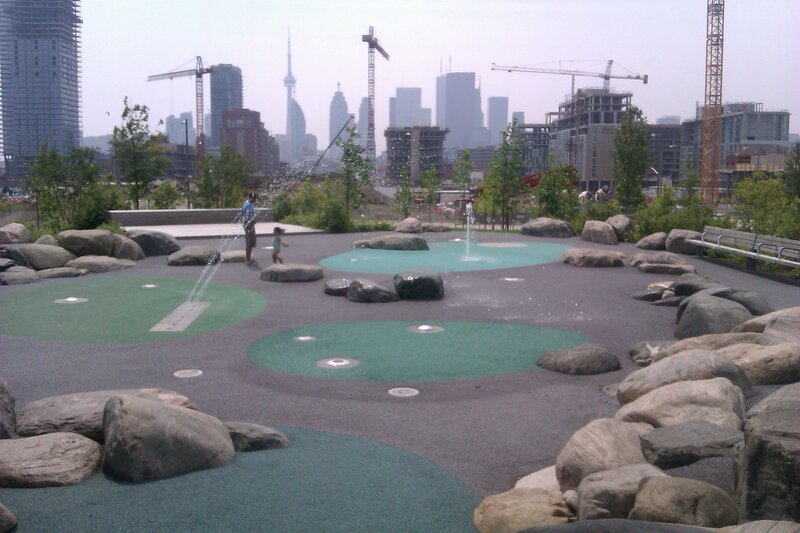 The park was built as part of Waterfront Toronto as one of their projects to revitalize Toronto's Eastern Waterfront and I can see what the minds behind it were thinking. The park is massive, and it's got plenty of diverse pockets: A cool modern playground, a fun play area, long grassy knolls, a gorgeous marsh, an unfinished urban prairie. Oops, that's right, only about half the park is finished and open to the public. Why would you open an unfinished park?! After all the criticism I gave, I still have to insist everyone check out this place before it closes Labour Day weekend. The finished parts of the park are a blast and a visual delight, and even watching the trains go by in the nearby railway corridor is fascinating. When the park is finished next summer, I guarantee it will breathe new life into this swiftly gentrifying area.